The eco-friendly company, Daymak Inc., has developed what they refer to as “the world’s first wireless power-assist electric bike.” The Shadow Ebike is a fantastic improvement on an increasingly popular mode of transportation, seeing that one of the most common issues with competitor models is faulty wiring. The way that this wireless electric bike works is quite interesting. It seems that Daymak has worked out any potential interference problems already. A frequency-hopping spread spectrum technology is implemented to keep the bike rolling no matter who happens to be using other wireless devices close by. All functions (turning the motor on or off, using the brakes, pedal assist and throttle) are all controlled in one place – the Daymak Drive Controller. What’s more exciting, there is even a USB charger for the folks who forgot to get their phone ready for a full day of texting! It is obvious that USB devices and all of their myriad uses are of huge importance in society when we need chargers on our electric bikes—it’s modern multitasking at its finest. There are absolutely no brake or gear cables. Any small wiring that is necessary is carefully hidden in the front wheel. This is also where the USB port can be found. There are two varieties of this green bike coming out on April 30th; one offers a 250W electric motor, and the other a 350W. It is estimated that this new way to ride can go 12 to 15 miles using strictly motor power. Using the pedal-assist increases that range to 22 to 25 miles. Prices begin at $1,999. The 36V 10AH lithium-ion battery takes approximately 4 to 5 hours to fully recharge in a simple w/110 outlet. After a full charge, it is good for about 750 to 800 cycles. Daymak builders predict future bikes with even more capabilities, such as interaction with smart phones or even personal computers! Those looking for an electric bike, without all of the complications that come from wiring being open to the elements, may want to take a look at Daymak’s newest creation. It’s the kind of novel idea that brings a whole new meaning to portable USB storage by expanding the possibilities of where you can charge and use your devices. Do you wish you had a bike with a USB port? 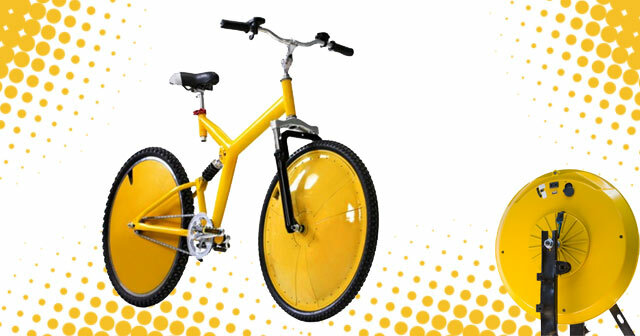 Tell us what you like or don’t like about this wireless bike! This entry was posted in Articles, USB Technology and tagged Shadow Ebike, Shadow Ebike Wireless Bike with USB, Wireless Bike with USB. Bookmark the permalink.